Wednesday 8th December 2010, 6:30 pm. Speaker: Elizabeth Sparrow, President BCS. We have set out on a journey in BCS that will lead to a sustained period of change through the coming year and beyond, and I will be heavily involved in projects that aim to fulfil our new mission to enable the information society. Today’s economy is built on knowledge and it’s on our ability to process, share and manage information that our society thrives or dies. At the heart of our activities lies a commitment to professionalism. We believe that all those working in IT and computing - practitioners, academics and researchers - need to become an effective integrated profession, and the Institute is well placed to lead that development. We have revised our CITP standard to reflect what employers have told us they need from their IT professionals. Working with leading academic groups we have established the BCS Academy of Computing to build a cohesive community inclusive of scholars, researchers and professionals with a shared commitment to the advancement of computing. We are also committed to increasing public confidence in IT and helping people become more active participants in the information society. I will be actively involved in our public engagement programme throughout my term as President. In this presentation I will look at some of the recent developments in our transformation programme, especially in our public engagement projects. Elizabeth Sparrow, author and consultant, is an experienced IT leader who specializes in transformational change programmes and outsourcing. 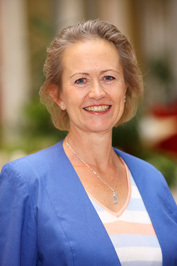 She became President of BCS in November 2009. In 2008 Elizabeth was awarded an honorary doctorate by the Open University for her public service and work in areas of special educational interest. Since launching her freelance career, Elizabeth has held interim management roles at NatWest Bank (now Royal Bank of Scotland) and T-Mobile and published two books on outsourcing and globalization. She is a regular speaker at professional events and conferences. Prior to 1999, Elizabeth was a senior IT leader in the public sector and has over 20 years experience of managing multi-million pound outsourcing relationships with a number of different service providers.